US Infrastructure: Is a Bipartisan Package Possible? HIGHWAY BUILDING: Senators advocate expanding road programs to other forms of infrastructure. 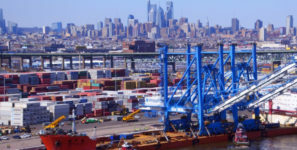 A smart infrastructure plan would emphasize investment in ports. During his State of the Union address, President Donald Trump called for a bipartisan infrastructure package to improve the nation’s infrastructure and invest in the future. Indeed, infrastructure will probably be a non-starter in Congress unless a bipartisan coalition backing legislation can be forged. What gives them reason for hope? Both senators serve on the Environment and Public Works Committee, which has jurisdiction over most infrastructure bills, and which includes senators from across the political spectrum. The senators would get money to cities and states by expanding existing programs, such as the Transportation Infrastructure Finance and Innovation Act of 1998—which focuses on highway building and road maintenance—by opening it up to other forms of infrastructure, including airports and inland waterways. It’s a message worth hearing, but time is of the essence. According to the American Society of Civil Engineers, waiting on making infrastructure investments now will cost the United States $3.9 trillion in GDP, $7 trillion in business sales, and 2.5 million American jobs by 2025.